Welcome back! Because spring is such a popular time for people to bring home new puppies, we have been spending some time in the last few blog posts looking at some useful ways to prepare your life and your home for your new furry family member. 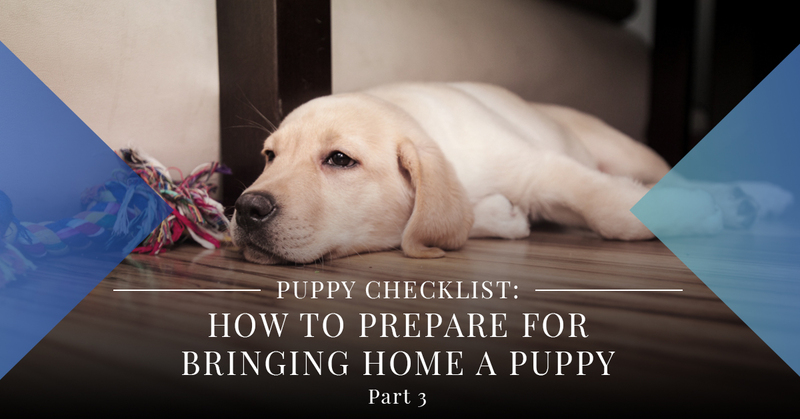 If you read parts one and two of this puppy-themed blog series, you learned about some of the essential puppy supplies to have on hand when you welcome a new pup into your home. Having key items such as a kennel, food and water bowls, training treats and a clicker, lots of safe chew toys, and all the right potty training supplies can make your life as a new puppy parent easier. These items will also help keep your puppy happy and healthy. Below are a few things you will want to stock up on before bringing your puppy home. You’ll want to introduce your puppy to grooming early so that they become comfortable with this necessary task early on. You will definitely want to bathe your puppy after bringing him or her home from the breeder or the shelter. After spending a lot of time in a close proximity to their littermates and other dogs, you’ll want to clean them with a puppy shampoo that is gentle on their skin, coat, and face. You will also want to brush them after their bath. Therefore, your initial puppy grooming kit should include a brush, shampoo, toothbrush, and puppy toothpaste. You might also consider nail clippers, although most people don’t feel comfortable trimming their pup’s nails on their own, so you might leave this task to professional groomers. Familiarizing them with a toothbrush early on will make home and professional doggie dental care much easier as they grow into adulthood. Much like a kennel, a puppy playpen gives your fur baby a confined space to play and rest in. Puppy playpens can be set up anywhere in the house where you spend a lot of your time so that you can monitor your puppy’s behavior without keeping them cooped up in their kennel. You will also want to get a kennel tray that can fit into your playpen to protect your carpets and flooring from accidents. Place a pillow or puppy bed in the playpen, along with an old towel (mind the frayed ends), and plenty of chew toys to keep them busy. Keep in mind that some breeds, like Labrador retrievers, can climb out of their pens, so you won’t want to leave them in these spaces unsupervised. Join us next time for part three as we look at a few more essential puppy supplies before moving on to our next topic: puppy-proofing your home. If you have any questions about your puppy or would like to schedule him or her for a puppy wellness exam and vaccinations, call us at Eagle Animal Hospital and Pet Resort. Thanks for reading!